Photorefractive keratectomy (PRK) consists of the application of energy of the ultraviolet range generated by an argon fluoride (ArF) excimer laser to the anterior corneal stroma to change its curvature and, thus, to correct a refractive error. The physical process of remodeling the corneal stroma by ultraviolet (193 nm wavelength) high-energy photons is known as photoablation. 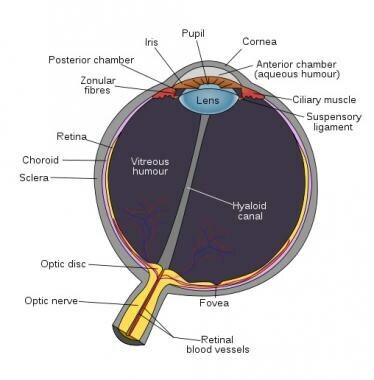 An image depicting human eye anatomy can be seen below. During the 1980s, several applications of the 193-nm ArF excimer laser were investigated, including its use on human corneas for the correction of refractive errors. In 1988, Munnerlyn, Kroons, and Marshall reported an algorithm relating diameter and depth of the ablation to the required dioptric change. McDonald performed the first excimer PRK for the correction of myopia on a normally sighted human eye in the United States. That same year, the Food and Drug Administration (FDA) organized a phase 3 trial, the PRK study (which ended in 1996), to demonstrate the safety, predictability, and stability of PRK for the treatment of myopia. At the end of this trial, 2 ophthalmic companies, VISX and Summit, were allowed to manufacture excimer lasers for widespread use in the United States. Since then, Nidek also has obtained approval for the manufacture of excimer lasers in the United States, and several hundred thousand patients have undergone this procedure throughout the world. The first excimer lasers used to perform PRK in the late 1980s have been improved significantly in terms of size, efficiency, and accuracy. Several epidemiological studies, including the Beaver Dam population-based survey taken in the United States, show a prevalence of myopia greater than 0.5 diopters (D), ranging from 43.0% in people aged 43-54 years to 14.4% in individuals older than 75 years. The intramolecular bonds of exposed organic macromolecules are broken when a large number of high-energy 193-nm photons are absorbed in a short time. The resulting fragments rapidly expand and are ejected from the exposed surface at supersonic velocities. This mechanism explains why only the irradiated organic materials are affected, whereas the adjacent areas are not affected. Myopia (-1.0 D to -6.0 D) - Higher corrections are associated with a greater risk of corneal haze formation; therefore, LASIK is generally the preferred procedure. Astigmatism (0.75 D to 3.0 D) - Higher corrections are associated with regression of the effect; therefore, LASIK is the preferred procedure. Hyperopia (+1.0 D to +4.0 D) - Haze and regression of the PRK effect have made LASIK the preferred procedure for most of these patients. PRK ablation of the anterior stroma takes place after removing the epithelium, which is approximately 40-50 µm in thickness. The Bowman layer is destroyed in the process of PRK with no known deleterious consequences. A residual stromal thickness of at least 250 µm after PRK is necessary to prevent future corneal ectasia. A residual stromal thickness of 400 µm or more is preferred. The epithelium can be removed via mechanical, laser, or chemical means. Contraindications include collagen vascular, autoimmune, or immunodeficiency diseases; pregnancy or breastfeeding; keratoconus; medications, such as Accutane (isotretinoin) or Cordarone (amiodarone hydrochloride); and a history of keloid formation. A recent report on the outcome of PRK in African Americans, including those with a known history of dermatologic keloid formation, revealed that a history of keloid formation does not appear to have an adverse effect on the outcome. These results question whether known dermatologic keloid formation should be a contraindication to photorefractive keratectomy. Guerin MB, Darcy F, O'Connor J, O'Keeffe M. Excimer laser photorefractive keratectomy for low to moderate myopia using a 5.0 mm treatment zone and no transitional zone: 16-year follow-up. J Cataract Refract Surg. 2012 Jul. 38(7):1246-50. [Medline]. Manche EE, Haw WW. Wavefront-guided laser in situ keratomileusis (Lasik) versus wavefront-guided photorefractive keratectomy (Prk): a prospective randomized eye-to-eye comparison (an American Ophthalmological Society thesis). Trans Am Ophthalmol Soc. 2011 Dec. 109:201-20. [Medline]. [Full Text]. Sia RK, Coe CD, Edwards JD, Ryan DS, Bower KS. Visual outcomes after Epi-LASIK and PRK for low and moderate myopia. J Refract Surg. 2012 Jan. 28(1):65-71. [Medline]. Korkmaz S, Bilgihan K, Sul S, Hondur A. A Clinical and Confocal Microscopic Comparison of Transepithelial PRK and LASEK for Myopia. J Ophthalmol. 2014. 2014:784185. [Medline]. [Full Text]. Celik U, Bozkurt E, Celik B, Demirok A, Yilmaz OF. Pain, wound healing and refractive comparison of mechanical and transepithelial debridement in photorefractive keratectomy for myopia: Results of 1 year follow-up. Cont Lens Anterior Eye. 2014 Jul 28. [Medline]. Shalaby A, Kaye GB, Gimbel HV. Mitomycin C in photorefractive keratectomy. J Refract Surg. 2009 Jan. 25(1 Suppl):S93-7. [Medline]. Fazel F, Roshani L, Rezaei L. Two-step versus Single Application of Mitomycin-C in Photorefractive Keratectomy for High Myopia. J Ophthalmic Vis Res. 2012 Jan. 7(1):17-23. [Medline]. [Full Text]. Alevi D, Barsam A, Kruh J, Prince J, Perry HD, Donnenfeld ED. Photorefractive keratectomy with mitomycin-C for the combined treatment of myopia and subepithelial infiltrates after epidemic keratoconjunctivitis. J Cataract Refract Surg. 2012 Jun. 38(6):1028-33. [Medline]. de Jong T, Wijdh RH, Koopmans SA, Jansonius NM. Describing the Corneal Shape after Wavefront-Optimized Photorefractive Keratectomy. Optom Vis Sci. 2014 Aug 28. [Medline]. Kobashi H, Kamiya K, Hoshi K, Igarashi A, Shimizu K. Wavefront-Guided versus Non-Wavefront-Guided Photorefractive Keratectomy for Myopia: Meta-Analysis of Randomized Controlled Trials. PLoS One. 2014. 9(7):e103605. [Medline]. [Full Text]. Dausch D, Smecka Z, Klein R, et al. Excimer laser photorefractive keratectomy for hyperopia. J Cataract Refract Surg. 1997 Mar. 23(2):169-76. [Medline]. Erie JC, McLaren JW, Hodge DO. Recovery of corneal subbasal nerve density after PRK and LASIK. Am J Ophthalmol. 2005 Dec. 140(6):1059-1064. [Medline]. Gambato C, Ghirlando A, Moretto E. Mitomycin C modulation of corneal wound healing after photorefractive keratectomy in highly myopic eyes. Ophthalmology. 2005 Feb. 112(2):208-18; discussion 219. [Medline]. Hashemi H, Miraftab M, Asgari S. Comparison of the visual outcomes between PRK-MMC and phakic IOL implantation in high myopic patients. Eye (Lond). 2014 Jul 4. [Medline]. Krueger RR, Trokel SL. Quantitation of corneal ablation by ultraviolet laser light. Arch Ophthalmol. 1985 Nov. 103(11):1741-2. [Medline]. McDonald MB, Kaufman HE, Frantz JM, et al. Excimer laser ablation in a human eye. Case report. Arch Ophthalmol. 1989 May. 107(5):641-2. [Medline]. Munnerlyn CR, Koons SJ, Marshall J. Photorefractive keratectomy: a technique for laser refractive surgery. J Cataract Refract Surg. 1988 Jan. 14(1):46-52. [Medline]. Nassiri N, Sheibani K, Safi S, Haghnegahdar M, Nassiri S, Panahi N, et al. Alcohol-Assisted Debridement in PRK with Intraoperative Mitomycin C. Optom Vis Sci. 2014 Sep. 91(9):1084-8. [Medline]. O'Brart DP, Patsoura E, Jaycock P. Excimer laser photorefractive keratectomy for hyperopia: 7.5-year follow-up. J Cataract Refract Surg. 2005 Jun. 31(6):1104-13. [Medline]. Paysse EA, Coats DK, Hussein MA. Long-term outcomes of photorefractive keratectomy for anisometropic amblyopia in children. Ophthalmology. 2006 Feb. 113(2):169-76. [Medline]. Rajan MS, Jaycock P, O'Brart D. A long-term study of photorefractive keratectomy; 12-year follow-up. Ophthalmology. 2004 Oct. 111(10):1813-24. [Medline]. Shaikh NM, Wee CE, Kaufman SC. The safety and efficacy of photorefractive keratectomy after laser in situ keratomileusis. J Refract Surg. 2005 Jul-Aug. 21(4):353-8. [Medline]. Taboada J, Archibald CJ. An extreme sensitivity in the corneal epithelium to far UV ArF excimer laser pulses. Proceedings of the Aerospace Medical Association. San Antonio. 1981. Tanzer DJ, Isfahani A, Schallhorn SC. Photorefractive keratectomy in African Americans including those with known dermatologic keloid formation. Am J Ophthalmol. 1998 Nov. 126(5):625-9. [Medline]. Taylor HR, Guest CS, Kelly P, Alpins NA. Comparison of excimer laser treatment of astigmatism and myopia. The Excimer Laser and Research Group. Arch Ophthalmol. 1993 Dec. 111(12):1621-6. [Medline]. Uozato H, Guyton DL. Centering corneal surgical procedures. Am J Ophthalmol. 1987 Mar 15. 103(3 Pt 1):264-75. [Medline]. Wang Q, Klein BE, Klein R, Moss SE. Refractive status in the Beaver Dam Eye Study. Invest Ophthalmol Vis Sci. 1994 Dec. 35(13):4344-7. [Medline].